The misuse and overuse of antibiotics is rampant in India, resulting in 'super bugs' that are resistant to all known types of drugs. New Delhi: When 60-year-old Lalit Kumar (name changed) was rushed to the emergency ward of a New Delhi-based private hospital on 15 August 2018, he was in septic shock (an extreme reaction to infection where the immune system turns on itself). After a minor cardiac arrest inside the ICU, he was put on broad-spectrum antibiotics in order to ward off infection. But his body wasn’t responding. By day 4, fever had set in and his condition began to deteriorate. Chest X-rays soon revealed evolving lesions in both the lungs. By then, tissue cultures which had initially been sent for tests came back and doctors began to unravel what exactly was going on. Kumar’s body was loaded with two pathogens—one in his lungs and the other in his bloodstream (Acinetobacter baumannii and Klebsiella pneumonia, respectively). Both of them were multi-drug resistant bacteria. The bacterium in the blood even produced a special enzyme to beat back antibiotics. Doctors believed the patient might have acquired the pathogens during a previous hospital visit. They had to act quickly. So, they ramped up the fight with newer varieties of antibiotics, including mildly toxic drugs like Polymyxin—virtually, the last line of defence. “God forbid, if these drugs had failed, it would have become impossible to save the patient," said Rajesh Pande, a critical care specialist. But it worked. Many other Indians, however, aren’t so lucky. India is one of the largest consumers of antibiotics in the world. And its misuse and overuse is rampant. As a result, ‘super bugs’ that are resistant to all known types of antibiotics are starting to thrive. For some, the last line of defence is a mirage. It doesn’t exist. Patients like Kumar, who are on prolonged dialysis and have end-stage kidney or liver disease, are at maximum risk from such ‘super bugs’ since they are frequently exposed to hospitals (a convenient congregating spot for pathogens). Infection-causing pathogens have been pinging away at humanity’s defences ever since Penicillin was discovered in 1928. Prolonged exposure to any drug allows certain strains of bacteria to acquire resistance, through natural evolutionary processes. But with both humans and the poultry/livestock industry overusing antibiotics, the window of effectiveness for new anti-bacterial drugs is getting shorter and shorter. While the problem is global, it is nowhere as stark as in India—where poor public health infrastructure, a high burden of disease, and cheap, unregulated sales of antibiotics has created ideal conditions for a rapid rise in resistant infections. “India is in the centre of a perfect storm," said Ramanan Laxminarayan, an epidemiologist and director of the Center for Disease Dynamics, Economics and Policy (CDDEP) in Washington DC. Since antibiotics have contributed significantly to a broad rise in life expectancy, and are used for everything from preventing infections during surgeries to protecting cancer patients undergoing chemotherapy, the weakening defences will leave a ripple effect on the entire healthcare chain. “If a cancer patient or an organ transplant patient gets an infection, the mortality rate can be as high as 70%. They [such patients] struggle to cope with low immunity levels and survival entirely depends on antibiotics" said V Balaji, professor of clinical microbiology at Christian Medical College, Vellore. “If they [antibiotics] are ineffective, we lose the patient. It is a helpless situation. All the advancements in medical technology made over the years would be of no use if antibiotics become ineffective," he added. That is why the United Nations now considers the threat of antimicrobial resistance (AMR) to be at par with diseases such as Ebola and HIV. Within India, several bacterial organisms which have become resistant to more than one variety of antibiotic drug have already been identified. Resistance to last-resort antibiotics is also increasing. “Diseases like pneumonia and typhoid have become difficult to treat. In 70% of the cases, treatment begins with more expensive, third-generation drugs, which are administered for a longer duration than before," said Sunil Gupta, additional director of the Delhi-based National Centre for Disease Control (NCDC). As per the 2017 Scoping Report on AMR in India, there is high resistance to broad-spectrum antibiotics like Fluoroquinolones and Cephalosporins. 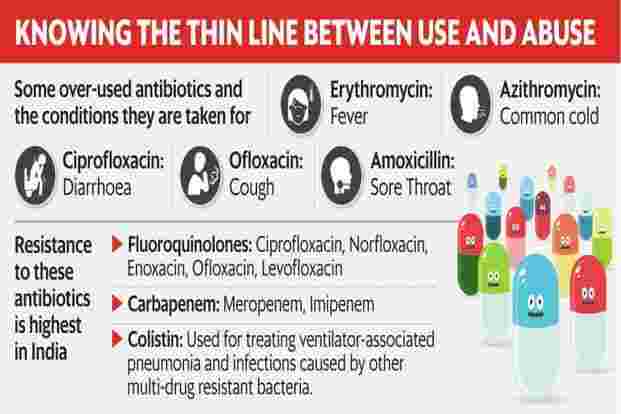 It includes Ciproflaxin sold under the brand names of Cipro or Ciloxan and Ofloxacin sold under the brand name Floxin, both of which are most commonly prescribed for respiratory and urinary tract infections. Even the third-generation Ceftriaxone, sold under the trade name Rocephin, has shown resistance. “Azithromycin too, since it is being excessively used is contributing to the emergence of super bugs," says Dr. Gupta. Antibiotics continue to be prescribed for common cold or flu, for which they are not even required. Powerful drugs like the newer-generation Cephalosporin is sold frequently for no apparent reason, highlight clinicians. While unnecessary prescriptions are a leading cause for the emergence of super bugs, lack of awareness among patients is worsening the situation. “If doctors try to convince them that it is not required, they will visit another clinician seeking a prescription, assuming that the first doctor does not know about antibiotics. This is nothing but abuse of antibiotics," said Pallab Ray, professor of microbiology at the Chandigarh-based Post Graduate Institute of Medical Sciences (PGIMER). Each time we use an antibiotic, we allow a few ‘super bug’ bacteria which are able to survive to thrive. Any person who takes a dose of antibiotics and discontinues it irrationally without completing the course is only helping bacterial strains acquire resistance. Ramanan Laxminarayan, the epidemiologist at the Washington-based CDDEP says there is little incentive for anyone to do the right thing as the situation is akin to a “tragedy of the commons". “For a single patient, the urgency is to get an antibiotic in the hope that it will work. The impact on the rest of society is not important to that patient or even many physicians. No single entity has an incentive and this is the reason why antibiotics are different from other drugs. If I misuse a cancer drug, that does not affect anyone else. But that is not the case with antibiotics," Laxminarayan said. Add on to this already skewed system of incentives a layer of quacks and questionable healthcare which many Indians continue to rely on, and it results in a potent mix. “There is inadequate access to allopathic care for most people in the country, forcing them to go to quacks or untrained doctors in the private sector, where there is maximum abuse of antibiotics. Until we provide basic facilities for everyone, the crisis cannot be contained," said A.K. Shiv Kumar, a development economist at Harvard University. India’s efforts at oversight and vigilance are weak in other realms too—particularly, the food industry. Since drug-resistant bugs can emerge from animals too and then latch on to humans, the meat industry’s well-documented practise of overdosing chicken and livestock with antibiotics to ensure they grow healthy is a growing area of concern. In a recent study, researchers from the Apollo Cancer Institute, Chennai and Christian Medical College, Vellore, found presence of a bacterium resistant to one of the most powerful known antibiotic in modern medicine’s arsenal—Colistin—in fresh food samples taken from various outlets in Chennai. The food items included poultry meat, mutton, fish, and vegetables. It was for the first time that presence of these highly dangerous bacteria was detected in India, though it has already been confirmed in 30 other countries. With even the last line of defence (as Colistin is usually referred to by clinicians) falling susceptible to resistant bacteria, the question was—what now? “Colistin is like the holy-water in the clinical package; the last hope used against the most rigorous bacterial infections. Our findings also indicated how these genes conferring resistance can get transmitted to humans," said lead researcher Abdul Ghafur, who is associated with the infectious diseases wing at Apollo Hospital, Chennai. Dr Gafur’s team wrote to the health ministry, urging it to ban the use of Colistin as a growth promoter in the poultry industry, which is now under consideration. The bacterial strains which were detected in Chennai could easily be transmitted to humans, either through the consumption of animal products or by direct contact between animals and humans. “More than vegetables, chicken carries a lot of antimicrobial resistant organisms. Some countries in the West have found 30% of their chicken harbouring multidrug-resistant organisms. In India, the percentage is likely to be much higher," said professor Balaji of CMC, Vellore. The problem could only get worse as the growing demand for meat and livestock products is expected to double the consumption of antimicrobials in India by 2030. Despite these emerging threats from multiple fronts, India has no public database of mortality caused due to antimicrobial resistance. However, a nascent surveillance network has been in place for a few months, under which researchers get access to data from 30 laboratories across the country. The government also finalized a national action plan on antimicrobial resistance in April 2017. There is now growing demand for tight regulations on the prescription and sale of antibiotics. But even as the old and existing arsenal of antibiotics is being lost to a growing array of resistant bacteria, no new drugs are entering the market. No new antibiotic has been discovered in last three decades, especially not against the gram-negative strain of bacteria prevalent in India. “The need of the hour is to enforce a new stewardship model—to give the patient the right drug, at the right time, in the right dose and for the right duration," said Kamini Walia, programme officer (AMR) of the Indian Council of Medical Research. “Otherwise, even the existing drugs will meet the same fate as the previous ones. And chances are if India does not put [effective] regulations in place, [other] countries may not even want to launch new drugs in India," she added.